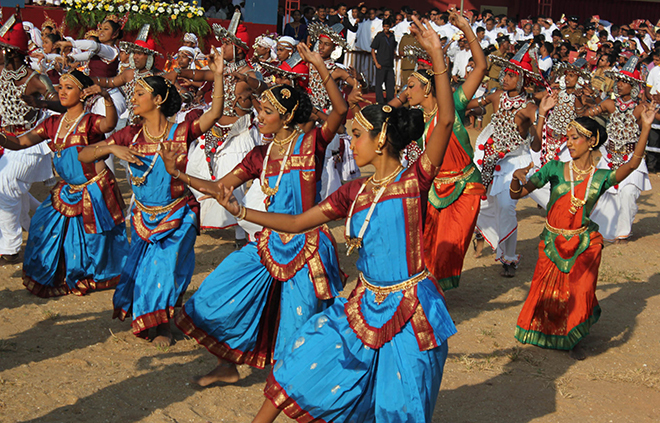 Saint’s day: Dancers wearing traditional dress add to the vibrancy of the occasion during the canonisation of St Joseph Vaz in Colombo, Sri Lanka, yesterday (January 14). CANONISING Sri Lanka’s first saint, who ministered to Catholics under persecution three centuries earlier, Pope Francis proclaimed what he called the “fundamental human right” of religious freedom. “Each individual must be free, alone or in association with others, to seek the truth, and to openly express his or her religious convictions, free from intimidation and external compulsion,” the Pope said yesterday (January 14), before a congregation of more than 500,000 in a beachfront park on the Indian Ocean. Pope Francis gave his homily half an hour after canonising St Joseph Vaz, a 17th- and 18th-century missionary from India who rebuilt the Catholic Church in Sri Lanka after its suppression by Dutch Protestant colonists. The Pope called on Catholics today to emulate the new saint by spreading the Gospel with “missionary zeal”. Noting that St Joseph had won the support of a Buddhist king by caring for victims of a smallpox epidemic, and thus “was allowed greater freedom to minister”, the Pope praised today’s Sri Lankan Catholics, who make up only seven per cent of the population, for their charitable service to their neighbours. The Church in Sri Lanka today “makes no distinction of race, creed, tribe, status or religion in the service she provides through her schools, hospitals, clinics and many other charitable works. All she asks is the freedom to carry out this mission,” he said. The canonisation Mass reflected the multicultural character of Sri Lankan society. The Pope celebrated the liturgy in English and Latin, but there were readings in the local languages of Tamil and Sinhalese. Drums and sitars accompanied the choir, and dancers in traditional costume performed before the start of Mass. The altar was housed in a structure whose peaked roof recalled the Buddhist temple architecture of Kandy, the central region of the country where St Joseph won acceptance for his ministry. Temperatures and humidity levels were both high and attendants held umbrellas over priests as they distributed Communion. As the canonisation service began, a black wooden cross was carried in solemn procession. The cross was one that St Joseph had planted in one of the churches; it has been preserved in the church in Sri Lanka’s North Western province. “There is no trace of St Vaz’s tomb. The only big relic we have is this cross. Wherever he went, he installed crosses,” spokesman for the papal visit Fr Cyril Gamini Fernando told Catholic News Service. At the end of Mass, Cardinal Albert Malcolm Ranjith of Colombo addressed the Pope, thanking him for the new saint, “God’s precious gem for Sri Lanka”. Cardinal Ranjith also asked for Pope Francis’ blessing and guidance in the search for reconciliation after Sri Lanka’s two-and-a-half decade civil war between government forces and rebels from the Tamil-Hindu minority, which ended in 2009. “We call upon you to kindly help us in that search for a true healing of hearts, the strength to ask pardon from each other for the senseless violence unleashed then, to forgive and forget that sad past and to arrive at a process of a give and take to build bridges of understanding between the parties hurt in the conflict. We are still far from reaching that goal,” the cardinal said. As Pope Francis gave the final blessing, people held aloft items, such as rosaries or statues; a deaf girl lifted a portrait of the new saint. Soon after the Pope left, priests swarmed the elevated altar and posed around the wood-carved statue of St Joseph as Sri Lankan and papal flags fluttered around it. The Mass was Pope Francis’ first public event on his second day in Sri Lanka. In the afternoon, he travelled by helicopter to the northern town of Madhu for a pilgrimage to a Marian shrine that sheltered refugees during the civil war. He was scheduled to fly to the Philippines early today (January 15). Next: Did I get my good side?